Geoff Johns's Aquaman series had a rocky start, with a short first arc that seemed more focused on attesting to Aquaman's "coolness" than really telling an Aquaman story itself. Aquaman Vol. 2: The Others, however, is a seven-issue collection that feels exceptionally robust, offers a compelling mystery, and spotlights well both Aquaman, his enemies, and his supporting cast. With The Others, the Aquaman title begins to resemble the great early days of Geoff Johns's Green Lantern run. The Others is the kind of story Johns tells well, if often. Aquaman's long-time foe Black Manta hunts Aquaman's former teammates, the Others, and Aquaman searches for both the Others and Manta over the course of the story, discovering the Others a few at a time -- see Justice Society: The Next Age and Justice League Vol. 1: Origin for something similar. Johns succeeds here in teasing out little details about the characters over the course of the story, rewarding attention and keeping the audience reading (how Vostok got his helmet, for one; the nature of the Prisoner's powers as another; but did anyone catch what happened to Shin's neck?). The end, in trademark Johns fashion, is both action-packed and resonates with the character of Aquaman himself. Johns made Black Manta fearsome already in Brightest Day, and his portrayal of Manta is similarly effective here (helped in the interim by Khary Payton's great turn as Manta in the Young Justice show). Johns plays with time and continuity a bit here, making this the first time Manta meets Aquaman's wife Mera, thus erasing most of Brightest Day (and Brightest Day's Aqualad Jackson Hyde) even as the impetus for the Aquaman series -- Aquaman's decision to remain on land after Brightest Day -- remains in effect. Though I like Aqualad (mostly again because of Young Justice), Johns offers a simple, potent origin for Manta here that I like a lot, especially since the character was something of a cypher before. All of this is a great contribution to the Aquaman mythos, and as well as Johns does with Black Manta, it makes me all the more eager to see him introduce Aquaman's brother Orm, the Ocean Master, later in this series. The flashback aspects in this story to Aquaman's original partnership with the Others is useful because it helps bridge the gap between today's Aquaman and the one we see in Justice League: Origins. Johns uses well Aquaman's "original" costume and especially the necklace Aquaman wears in Origins, such to draw those two stories together. Inasmuch as this story explains about Aquaman's origins -- how he grew up human, when he left the surface after the death of his father -- there remains various gaps as to when Aquaman first ventured to Atlantis, why (if not Brightest Day) he returned to the surface, and so on. I'd eagerly read an Aquaman: Secret Origin story if Johns wrote it, or maybe he'll address these aspects in the "Throne of Atlantis" storyline coming up next. I rather like artist Ivan Reis's work in these pages. I have not always liked it, finding Reis's sketchy lines too indistinct for my personal taste on cosmic titles like Green Lantern, for instance. No question of Reis's talent, however, and with all the wind and rain that peppers The Others, Reis's less-defined style helps bring forth the mood of the story. I'm still cautious about Reis taking over from Jim Lee on Justice League, but The Others has helped alleviate my concerns somewhat. In all, Aquaman Vol. 2: The Others creates a more compelling case for continuing to read the Aquaman series than volume one did. Though Johns's conceit that Aquaman is the "least liked" hero both outside comics and within is cute, the character needs more; with The Others, Johns shows Aquaman to be complicated and nuanced, and I'm far more enthusiastic about the third volume now than I was for the second after the first. Up next, something a little different with my review of Star Wars: Dawn of the Jedi: Prisoner of Bogan. See you then! I wasn't too crazy about the first volume, but I'll definitely be giving this one a go. Wouldn't be the first time you turned me around on something. My sentiments exactly; if you kind of liked but weren't really sold on the first volume, I recommend giving the second one a shot. Turned me around on the series. The "Throne of Atlantis" crossover does deal a little more with the 5 year gap between Origin-era Arthur and the present-Arthur. It also really pushes the series to new heights, building on the momentum Johns establishes here. I actually liked the first volume better. That's probably because I didn't find the Others to be very interesting, nor the history they share with Aquaman. Skip, I think. 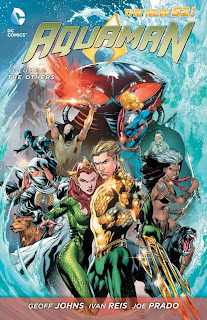 Get the Justice League: Throne of Atlantis collection and find Aquaman #0 in the quarter bin, and that way you've got the same material without buying two trades. Yeah, I guess. Or I will get the paperback, instead of the Hardcover. The reason I'm still undecided is that there was a solit at one point, where JL, Vol. 3 only included Aquaman #15-16. So I'll probably wait until it comes out and decide then.